Throughout her short life Amy Levy was a trail-blazer who challenged the status quo. Born into a middle-class mercantile family of second-generation Jewish immigrants, her parents (neither of whom were well educated) were ahead of their time inasmuch as they provided their daughters with the same standard of schooling as their sons. Amy, who, from an early age displayed a precocious intellect, was the main beneficiary of their openminded approach to education. After being tutored at home by an ‘advanced’ governess who encouraged her to write poetry and took her to women’s rights meetings, at around the age of fifteen, she enrolled at the Brighton High School for Girls. Here she came under the influence of her second advanced teacher, the headmistress Edith Creak. Edith herself had received a far better education than that customarily given to girls at the time. This was due to the fact that her father was headmaster of a boys’ school in Hove, and there she had studied the classics alongside her father’s pupils. In 1871 she became one of the first five women to study at the recently founded Newnham College, Cambridge. Thanks to Edith Creak’s inspirational teaching, after passing the Cambridge Senior Local examination, Amy Levy achieved a similar distinction by becoming the first Jewish woman to be admitted to Newnham in October 1879. While she was at Cambridge Amy struggled with what she described in a letter to her mother, as her ‘accursed shyness’. There seems little doubt that, although she was not the victim of any direct racial prejudice, her awareness that her ethnicity set her apart from her fellow students tended to make her appear withdrawn and aloof, and thus unapproachable. Her feelings of inadequacy and alienation also predisposed her to hero worship. Throughout her life she formed a series of intense attachments to charismatic individuals who she felt possessed the superior physical and/or intellectual qualities that she lacked herself. The first of these idols was her headmistress at the Brighton High School, Edith Creak; the second was Jennie Stanford, the wife of Charles Villiers Stanford, the conductor of the Cambridge University Musical Society. Amy gave eloquent expression to her feelings for Mrs. Stanford in two of her finest poems: ‘To Sylvia’ and ‘Sinfonia Eroica’. Both of these verses were written shortly after she left Cambridge, in late 1881 or early 1882. These poems, together with others addressed to women, have created the widely held belief that Levy was a lesbian. 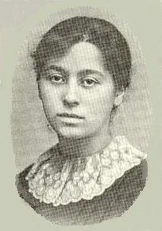 But this black and white view of her sexuality has recently been challenged, as evidence has emerged that she harboured similar sentiments for Karl Pearson, her contemporary at Cambridge, who was at that time a Fellow of King’s College and later appointed Professor of Mathematics at University College London. Like Edith Creak, Pearson possessed a first class intellect, and like Jennie Stanford he was a paradigm of English good looks – fair haired and blue eyed, with regular, well-cut features. Pearson and Levy knew one another well through their joint membership of the radical London debating society ‘A Men and Women’s Club’ which they both first attended in 1882. Just before Levy left the University in 1881, a small Cambridge publisher, E. Johnson & Co., issued her first collection of poetry under the title Xantippe and Other Verse. The success of this slim volume set her on course for a literary career. During the next nine years she published two further collections of poetry, three novels and numerous articles for magazines and newspapers. However, no amount of literary acclaim could boost her ever fragile self-esteem. Subject to prolonged periods of mental and physical ill health, throughout the mid 1880s she made a series of extended journeys to Continental Europe in order to escape the confines of her parental home and, by visiting new places and encountering new faces, alleviate the melancholy that haunted her throughout her adult life. It was during the first of her two stays in the city of Florence in the spring of 1886 that she met Vernon Lee, the woman who replaced Pearson in her affections after the cruel snub that he inflicted upon her when he blocked her membership of his second Men and Women’s Club, which he founded shortly after the demise of the first club in 1885. 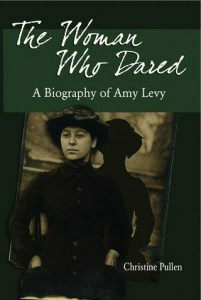 Following this rejection, realising that her independent lifestyle was at odds with the expected role of women within Jewish society, Amy made a determined effort both to increase her income and to further establish her reputation in the literary world by turning to the more commercial genre of the novel. The first of these, The Romance of a Shop, was published in 1888. Amy openly acknowledged in a letter to Vernon Lee that this work was written with an eye on the market – describing it as ‘slight and aim[ed] at the young person’ adding: ‘You mustn’t pitch in to me about it – it fulfils my own aims, more or less …’ The narrative, which charts the adventures of four sisters, who, after the unexpected death of their father, set up shop as photographers in London’s Baker Street, is an early example of the New Woman novel that came to prominence in the 1890s. In contrast, for her second novel, Amy took her readers on a journey that would have been entirely unfamiliar to the majority of them, into the closed, conservative heart of the London Jewish community. Unlike the independent, strong-minded female protagonists of Romance of a Shop, the heroine of Reuben Sachs, Judith Quixano, is a paradigm of the type of woman much disparaged by Amy in an earlier essay for the Jewish Chronicle entitled: ‘Middle-Class Jewish Women of To-Day’. She described such women as ‘a crowd of half-educated, pampered creatures, absorbed in material enjoyments … whose highest desire in life is the possession (after a husband) of a sable cloak and at least one pair of diamond earrings’. In a similar vein, the heroine of Reuben Sachs, Judith Quixano, sees herself, ‘merely as one of a vast crowd of girls awaiting their promotion by marriage’. Although Reuben Sachs was a commercial success, the unflattering portrait that, once again, Amy painted of what she perceived as the physical and emotional shortcomings of her ethnic family stirred up considerable resentment among them. It was perhaps for this reason that, for her third novel, Miss Meredith, she adopted a tried and tested formula, reverting to a literary genre – that of the trials and tribulations of the Victorian governess – which, by the 1880s, was becoming decidedly passé. However, as the novel was originally commissioned as a serial for the British Weekly – whose readers would not have been pleased to find ‘advanced’ works of fiction within its pages – it may just be that, as with The Romance of a Shop, Amy was tailoring her narrative to suit her potential readers. Sadly, despite her literary success and the support of her friends and family, Amy was ultimately unable to reconcile what Oscar Wilde described as ‘the cravings of her heart’ with the reality of her life. On the 9th September 1889 she sealed herself into a small room in her parents’ house in Bloomsbury, lit a charcoal fire in the grate and lay down upon the bed to await the deadly fumes to carry her to oblivion. At the time of her death she was just two months short of her twenty eighth birthday. In death, as in life, she defied convention, going against Jewish law by leaving instructions that her body be burned rather than buried, thereby becoming the first Jewish woman to be cremated in England.